A Belgian brew with an English accent. 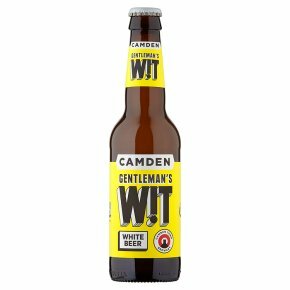 Classic white beer spiked with lemon and fragrant with bergamot, Gentleman’s Wit has a smooth, full body and a spicy finish. With lemon zest and bergamot. Unpasteurised and unfiltered. Suitable for vegetarians and vegans.Malt: Pilsner, Wheat, Torrified Wheat Yeast: Belgian Wit Yeast Kettle Hops: Perle Who gives a wit? We do and it's not rude. Based on a traditional Belgian wit (white) beer, we've added the bergamot and lemon zest of Earl Grey tea for a well turned out beer that politely packs a punch.